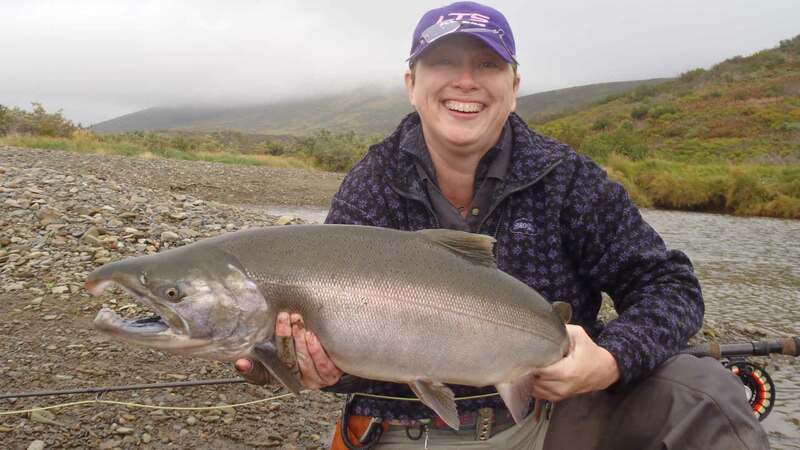 Alaskan Peninsula - Daily fly-outs - Blue Mountain Lodge is located in the island arm of Becharof Lake, 60 miles south of King Salmon, in the heart of the best fishing that the Alaska Peninsula has to offer. Its breathtaking scenery, combined with plentiful fish and game, make this a sportsman’s paradise. Daily fly-outs are included in the package. This is the best value for a fly-out lodge that we have found." The owner Tracy Vrem with rainbow (above). Tracy Vrem has logged over 8,000 hours flying time on the Alaska Peninsula. For the past 30 years, he's provided a professional, dependable, guiding service. 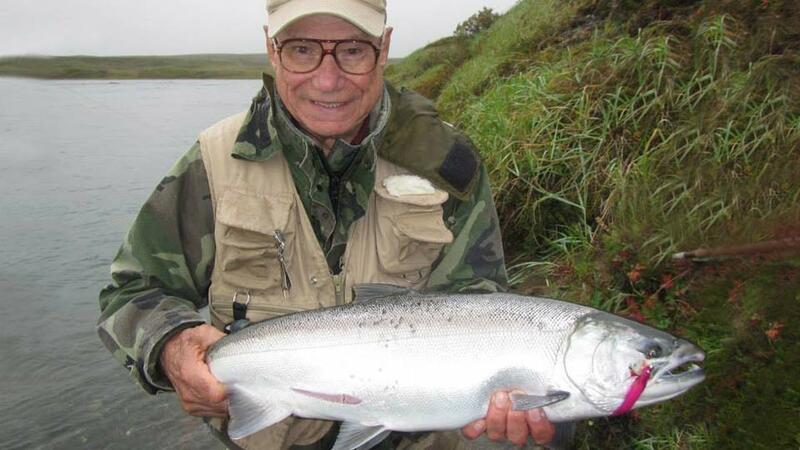 There are few people more familiar and comfortable in this area of the Alaska Peninsula. Blue Mountain Lodge caters to a maximum of six anglers per week and is Orvis Endorsed. Orvis-Endorsed operations cater to every ability from beginner to expert; and, meet high standards of great service, great fishing, and experienced, professional staff. The terrain on the peninsula is mainly tundra with numerous lakes and streams. The eastern side of the peninsula is laced with volcanic mountains forming the Alaska Peninsula Range. The area is the spawning grounds for all species of salmon. Each year millions of salmon crowd the lakes and streams. This abundance of food helps to support one of the densest brown bear populations in the state. The Alaska Peninsula also supports a wide range of wildlife, including the Northern Peninsula caribou herd and moose averaging 60-inch racks. There’s a great variety of fishing locations, beautiful scenery and the ability to customize your daily activities. 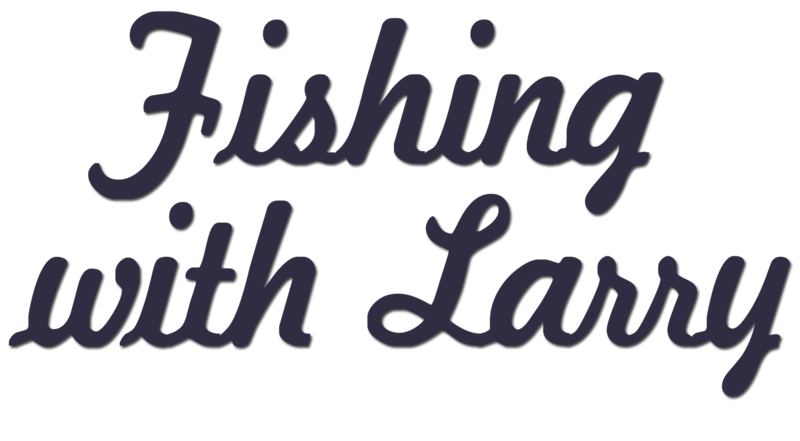 The majority of their fishing trips are booked from referrals. 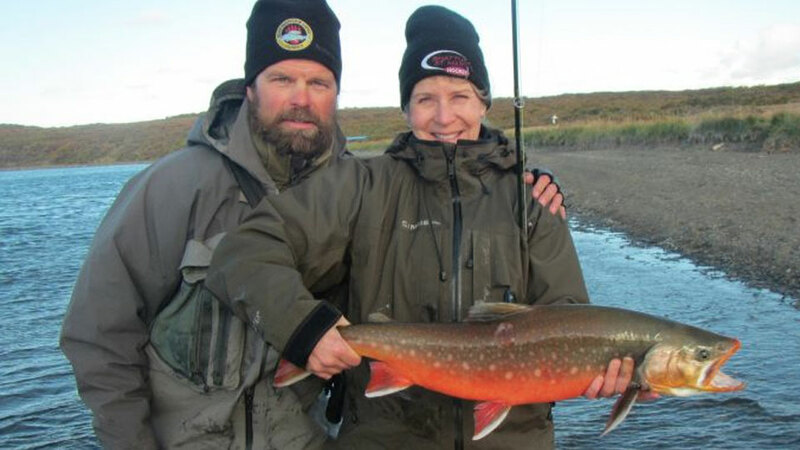 Since the mid-1980s, clients have been returning to fish with Blue Mountain Lodge. The Lodge has two Piper Super Cubs, one on wheels and one on floats, a Cessna 180 on floats, and a Cessna 182 on wheels. Tracey Vrem is your pilot and guide. He has over 8,000 logged hours of flying time on the Alaska Peninsula. Tracy will stay with you throughout the day, offering his expert advice. Guides: Three anglers per guide. Your pilot is your guide. 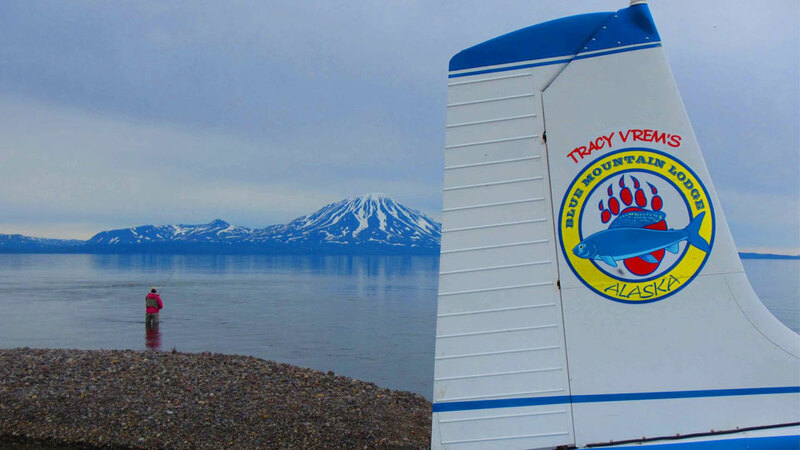 Tracy’s pilots have thousands of hours flying and guiding in Alaska. Boats: There are no boats. 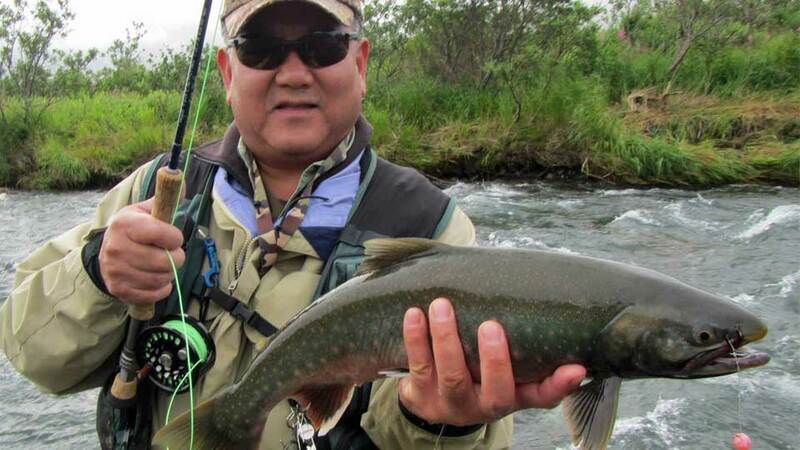 This is a daily fly-out trip that involves hiking to the river, wading, and covering ground. 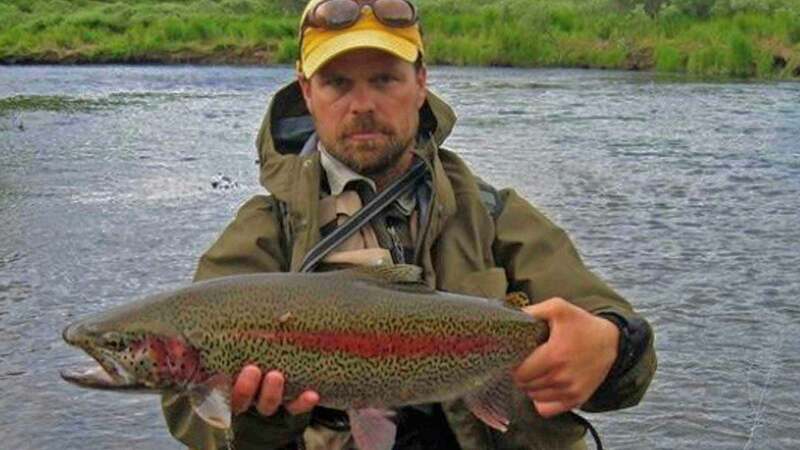 Equipment: The Lodge provides spinning and fly-fishing rods and reels. Flies and lures can be purchased at the Lodge. We provide a complete list of suggested tackle in our confirmation packet. Fishing License: Your fishing license is not included in the package. Monday through Friday, you’ll take a short flight to an untouched stream or river. 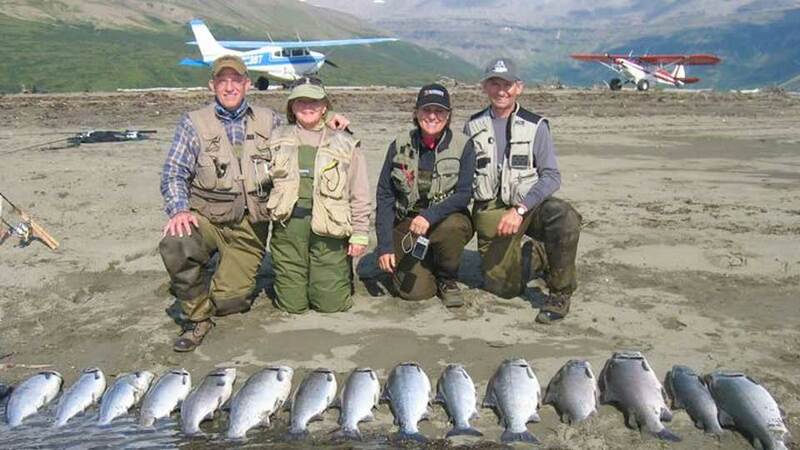 You’ll load into the planes around 8:00 a.m., and fish until 5:00 p.m. before returning to the Lodge. 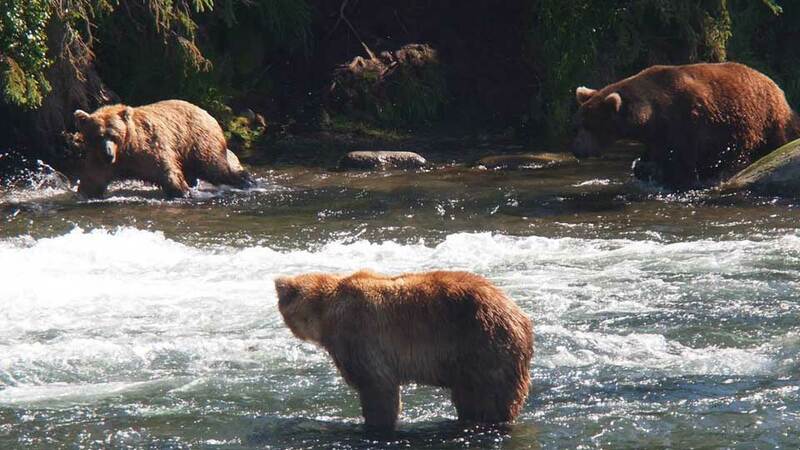 Bear Viewing: 30-minutes from the Lodge is the world-famous Brook’s Falls in Katmai National Park. The Lodge flies to Naknek Lake and Brook’s Falls is a short hike from there. Usually, they’ll spend half a day visiting the falls and viewing the bears. Upon request, this can be added to your package. 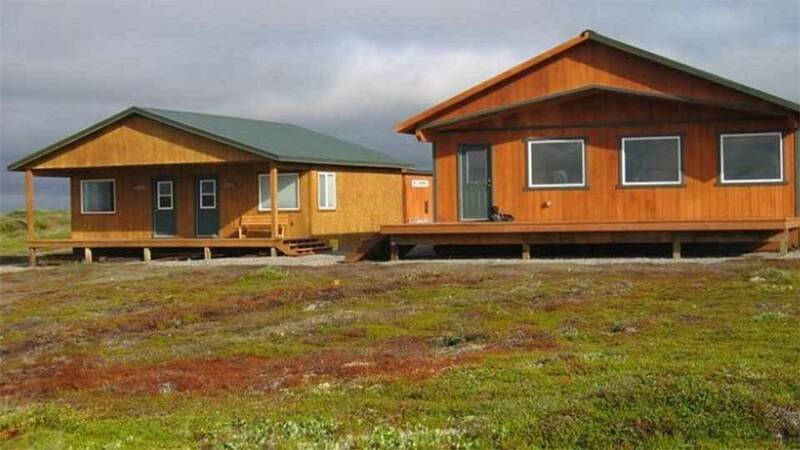 “I went on an exploratory trip to the Bristol Bay area to see Tracy Vrem's Blue Mountain Lodge on June 10-11, 2012. I'd had good reports about Tracy's lodge from other lodge operators. Tracy has a fly-out lodge that has many small to medium sized streams within a 10 to 30-minute flight from the main lodge. 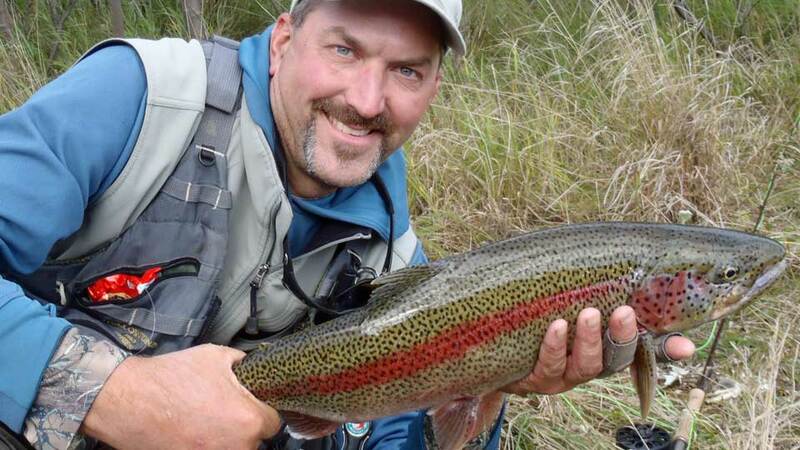 I knew we were early for some of the better fishing, but we still caught about a dozen rainbows from 16 to 23-inches in about an hour of fishing with smolt and wooly bugger patterns at one of his special rainbow spots. I also caught six dollies from 16 to 22-inches. in his favorite silver hole. In the two days I was at Blue Mountain Lodge I fished a total of about three hours. We did a lot of flying so that I could see most of the streams that Tracy fishes. We saw about ten brown bears, seven moose, a wolf, and lots of ptarmigan and waterfowl. The rainbows in this area average about 20-inches and go up to 26-inches. They get some big char up to 13 pounds. The grayling are huge, up to 23-inches. All five species of salmon are present in good numbers. They get kings to 45 pounds and silvers to 16 pounds. Tracy offers combo ptarmigan hunt fishing trips after August 10th (not available for the 2019 season), and he also does some waterfowl combo trips. If you are a big game hunter, Tracy offers world-class brown bear and moose hunts. Tracy averages about one day every two years where they cannot fly-out due to weather. They rarely if ever have conditions where you cannot fish due to poor water conditions. This is the best value for a fly-out lodge that we have found." You'll fly to King Salmon, Alaska. A Blue Mountain Lodge pilot will pick you up between 5:00 p.m. and 7:00 p.m. and fly you to the Lodge, a 55-minute flight. The roundtrip charter flight from King Salmon to Blue Mountain Lodge is included in the package. Our confirmation packet includes complete details. Their main lodge was built in 2010 and offers a beautiful view of the lake, Blue Mountain, and the Aleutian Mountains. The Lodge is located on an abandoned oil exploration road system. This road system is not connected to any village or highway. The duplex-style guest cabin has two private bedrooms and two front rooms that have bunk beds and a small common area. Both sides include a private bathroom with a shower and flush toilet. The Lodge hosts up to six guests and can accommodate up to two couples. You’re welcome to bring your video camera, and they have a flat-screen TV at the Lodge for watching the day’s activities. Cell phones do not work in this area; however, free Wi-Fi is available at the Lodge. 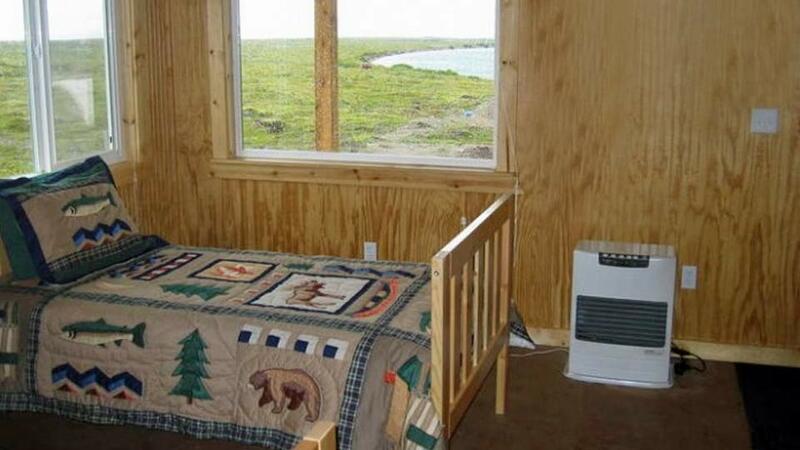 There is also a freezer for preserving your trophy or any salmon you wish to take home. Blue Mountain Lodge YouTube video. 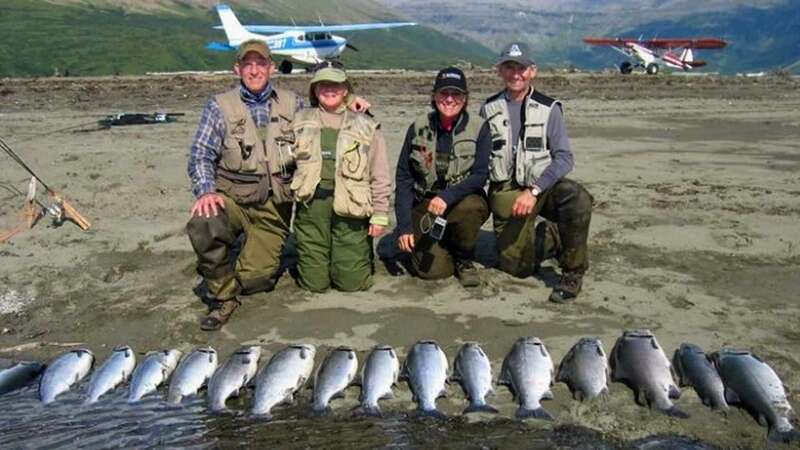 Roundtrip charter flight from King Salmon to the Lodge, lodging, meals, beer, wine, and soft drinks, Wi-Fi access, guided fishing, ptarmigan and waterfowl hunting (when permitted), daily fly-outs to remote streams, use of rods, reels, and shotguns (for hunting packages). airfare to King Salmon, gratuities, hard liquor, terminal tackle, fishing and hunting license, shotgun shells ($15.00 a box), king salmon tag, duck stamps, $20.00 for waxed boxes (optional for frozen fish), and anything not mentioned under inclusions. Request Tracy Vrem's info packet.